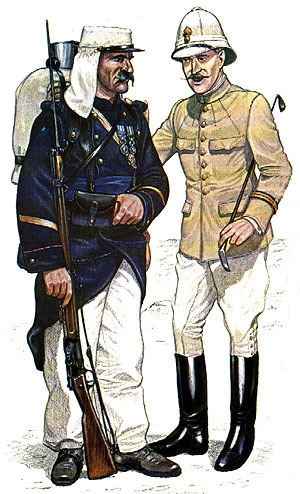 Taken from "Uniforms of the French Foreign Legion"
The Officer is take from a sketch of Selchauhansen, killed in action at El Moungar 1903. The Khaki uniforms were introduced in 1895 but took time to be fully adopted. the Kepi, with or without white or khaki covers were more often worn in the field.